Of the trainers we carry, this is the most "diaper-like". It is a pull-down diaper cover. 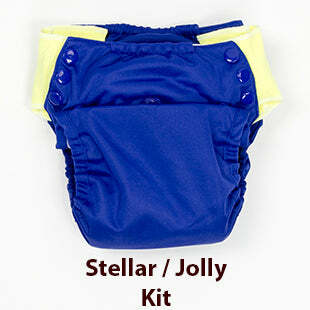 Place one of the absorbent pad inside which attaches inside with soft hook and loop fasteners. The kit comes with 3 pads. It has front rise snaps to adjust the rise. 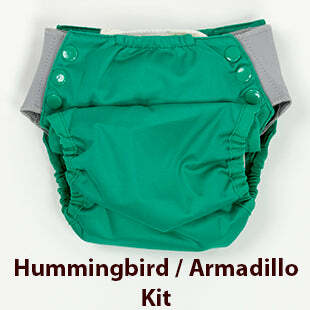 It fits well for older kids, too, up to 4T or about 50 pounds, depending on shape. Stock Status: In Stock. Usually ships the same or next business day. All BumGenius and Flip products can ship to USA addresses only. One-size fits most from about 20 pounds and up. Fit note from Karen: this fits best on average to rounder shapes. It might slide down on flat-bottomed, tall and thin shapes. This page is for the KIT. 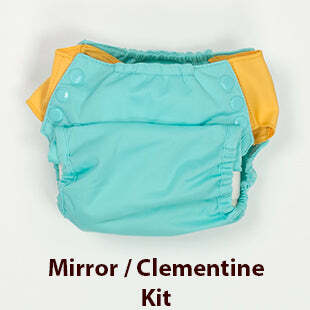 The Kit includes 1 training pant with stretchy sides and 3 organic cotton pads. You remove the pad and place a fresh pad inside through a few wet accident changes. The pad is held in place with soft hook and loop closures. *Fit is approximate and may vary depending on size & shape of your baby. U.S. Pat. 8,430,857. Canada Pat. 2,844,249. Other U.S. & International patents pending. Made in USA of domestic and imported materials. Manufactured by Cotton Babies. The Shell Only is sold separately here. How was your overall experience with this product? Your input is very much appreciated. Please share your review with your friends! 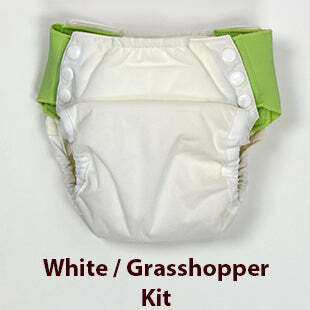 I really wanted to love this product but it really functions more as a diaper, which is not want I was looking for. It was too absorbent for my child to sense wetness. That said, I think this will come in handy for over night and when we have a long drive. I love these for potty training. They allow the child to feel some wetness, but they do not leak. 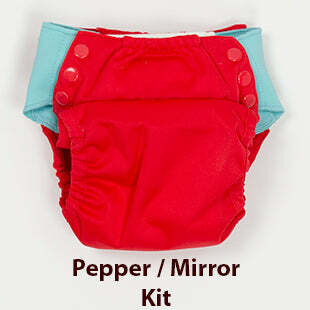 I have been using cloth diapers for over 3. I have been using cloth diapers for over 3.5 years and am very happy with this trainer. It's very trim fitting and my 42 pound son has room left in the groin area and is on the last snaps. He pulls it up and down easily even in public. If he has a light leak I simply change the pad inside. It's very light for my cloth diaper bag because all I carry are the inserts and he keeps wearing the shell. There is velcro in the front and back of the shell that hold the insert in place and it stays put. Only improvement I would like to see for this shell is a lining. There are parts of the shell where the PUL touches the skin, just like a cloth diaper shell, and I do wish there was some lining there. But, overall this is a great system and the pad is more absorbent then underwear or a very thin trainer. The outer layer is waterproof and keeps my sons pants from getting wet. Just like natural fiber diapers, like prefolds, the cotton inserts needs to be prepped. This means that they need to be washed a few times to reach their maximum absorbency. In addition to the removable pad. There are many options for adjustment. The wings have two size settings and can be completely removed to change colors. There is a contoured cut to the wings for the hip and they are stretchy. The front of the pant has rise snaps that allows for more or less room when growing. Really this could be used as a diaper on a bigger baby and easily transition into potty training. It's more narrow through the crotch then the BG 4.0 and 5.0 cloth diapers and fits nicely under clothing. I've used these with two children and really didn't have much success with either of them. I've used these with two children and really didn't have much success with either of them. They really just don't fit any stage of potty training well. These really aren't any different than a diaper when it comes to how they feel. They are just as water resistant, wick very well, and are nearly as absorbent. Usually, my kids didn't even notice when they had wet the pants until they were absolutely sopping. During that first stage of learning, they have to notice those first few drips of urine. Otherwise, they can't get to the potty in time to correct the situation! So, these pants are useless for early learning. 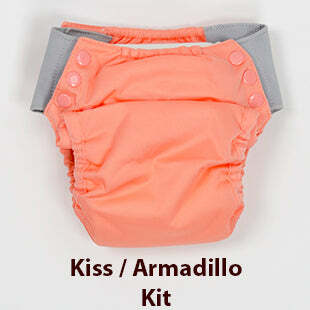 They're just as bulky as the Flip diapers (so they don't fit well under toddler pants). The side panels make them very easy to slide on and off. Unfortunately, this means they often slide off when you don't want them to. My daughters were always hiking their pants up. Even on the tightest setting, the side panels just can't hold up the weight of the pants and insert. They stretch out of shape very quickly. Because of these fit issues, the pants just aren't comfortable, especially under clothing. My third daughter cries when I pull them out. While they're too absorbent for daytime learning, they're also not absorbent enough to use at nighttime. So, they don't even make good "occasional bed wetter" pants! Changing out the pads during the day is a PITB. It's the *exact* process of changing a diaper (unsnap, un-stuff, re-stuff, place on child). For my kids, this led to an identical experience of having a diaper changed, except they weren't lying on a table. Not good when you're trying to impress upon them the idea that diapers are no longer acceptable. Honestly, I had four of these, but I just can't seem to find a use for them that outweighs the negatives. Maybe long car rides when they're finally trained, but who wants to sit in these bricks while strapped into a car seat for a few hours? These do not even come close to fitting my almost three-year-old. These do not even come close to fitting my almost three-year-old. He's very small, wearing clothing size 18-24 months, and weighing about 23lbs. However, I expected them to be a bit more adjustable than they are. He won't wear them because they are too loose. I will save them for our younger son who is a larger baby and, I think, will be a larger toddler. Periodically we send out emails to announce sale items, seconds, and/or new products. Please consider subscribing. We will never sell, exchange or market your information in any way. You can unsubscribe from our newsletter at any time. The home of the Cloth-eez Brand and more. © 2019 Green Mountain Diapers. This site contains original images and copyrighted text.